The Exclusive Option Leather Stitched Inner Door Sills feature contrasting stitching on complementing the rich leather surface. This complete inner doorsill set is an easy installation that instantly adds an exclusive tailored ambiance upon entering your Porsche’s cockpit. 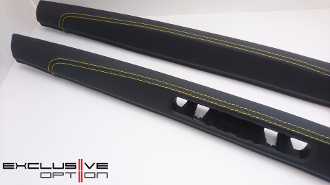 These parts replace the cheap-looking standard plastic sills with rich leather and give your Porsche a distinctive exotic look especially with the colored stitch. These parts are more delicate than plastic and require extra care when exiting and entering the interior, but they are well worth it.